18th February 2009. Locomotive 66024 approaches Worting Junction near Basingstoke on this bleak day with train 6Z26 from Hinksey Yard to Eastleigh. 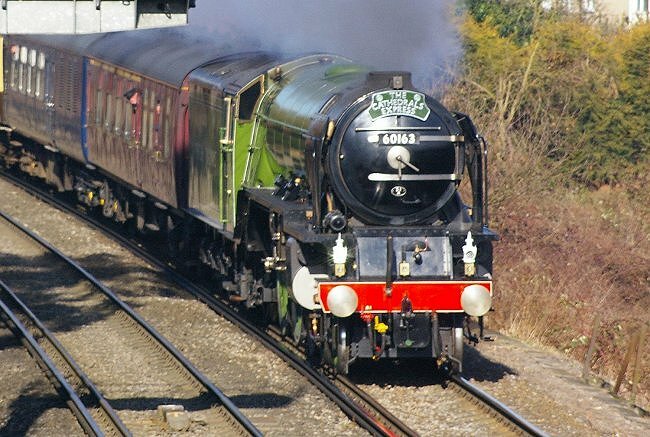 14th February 2009.Steam locomotive 60163 "Tornado" approaches Coxes Mill with train 1Z94 "The Cathedrals Express" from London Waterloo to Overton. 12th February 2009. 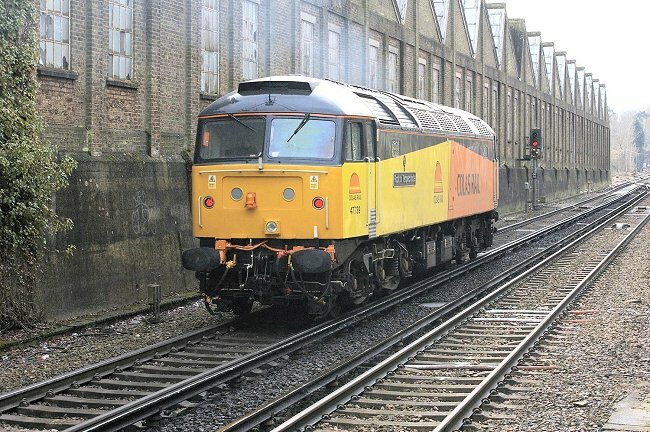 Colas Rail locomotive 47739 waits to enter Effingham Junction depot, having run light engine from Tonbridge West Yard as train 0Z47. 10th February 2009. 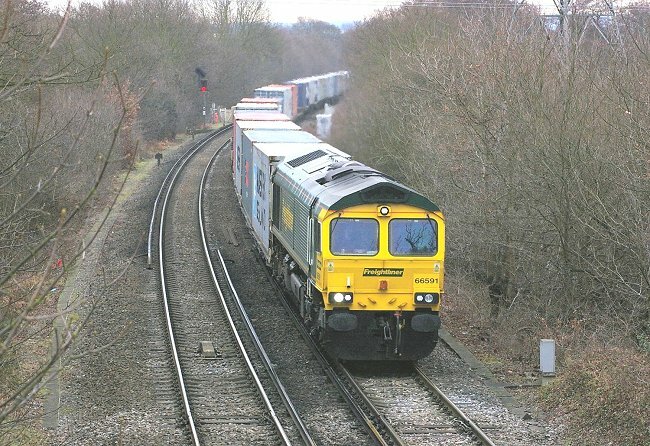 Freightliner locomotive 66591 heads container train 4M98 from Southampton to Ditton past Coxes Mill. 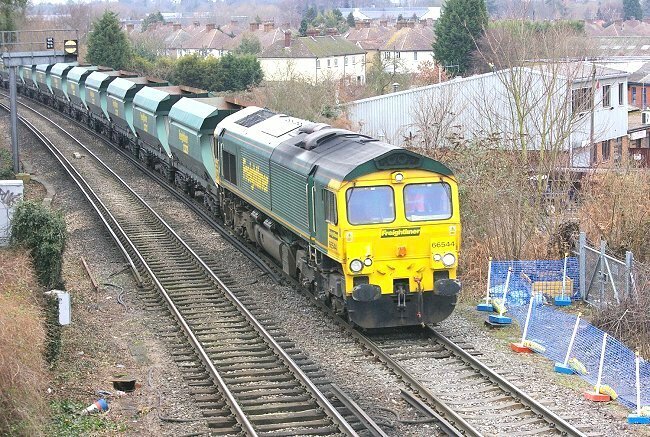 The train was diverted away from its normal route due to engineering work. 10th February 2009. 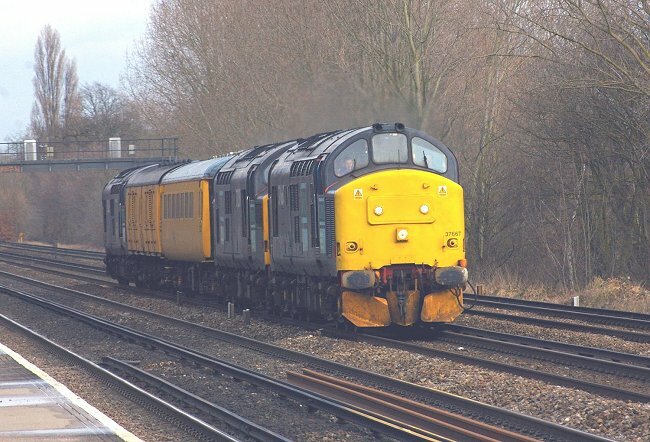 DRS locomotives 37667 and 37259 head Serco test train 1Q18 through Hersham station. Number 37259 had failed and was rescued by 37667 and taken to Woking. 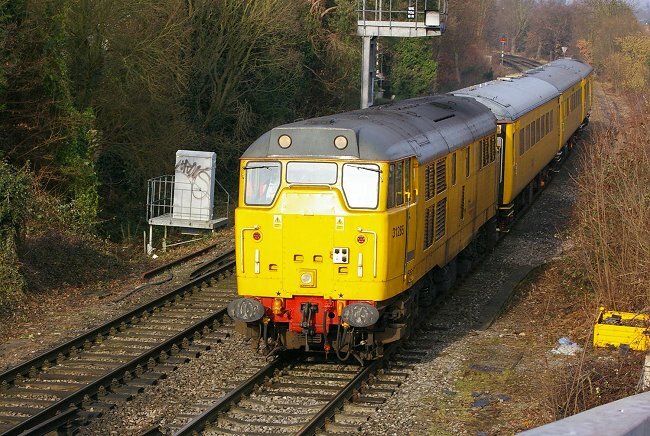 A further DRS class 37 is at the rear of the train. 30th January 2009. 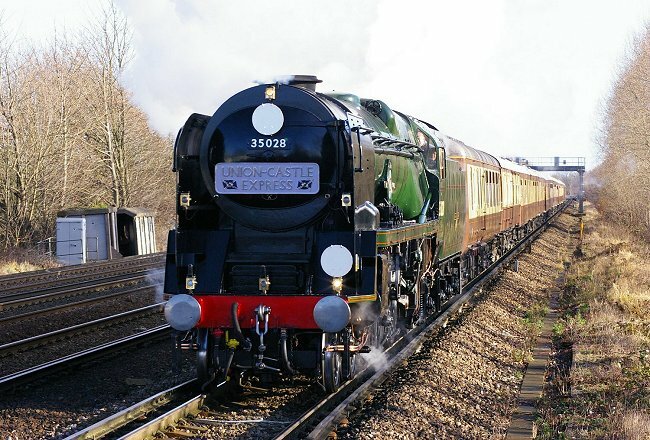 Merchant Navy class Pacific locomotive 35028 heads a train of Pullman cars past Coxes Mill. The train is 1Z82, a circular tour from London Victoria via Staines, Guildford and Redhill back to London Victoria. 30th January 2009. Locomotive 31258 hauls Serco test train 1Q12 past Coxes Mill, heading south in the strong directional sunshine. 24th January 2009. Locomotive 66154 in EWS livery heads train 4O27 from Trafford Park to Southampton as it approaches Coxes Mill. The train was diverted off its normal route by engineering work. 24th January 2009. 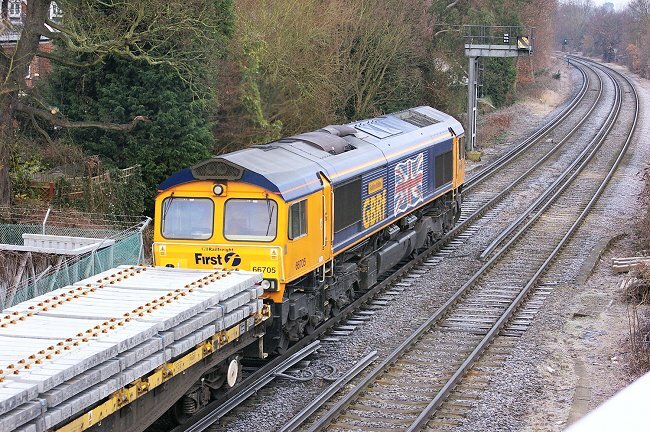 Locomotive 66705 in GBRf Union Flag livery approaches the repeater signal near Coxes Mill with engineering materials train 6G14 from Eastleigh to Barnes. 17th January 2009. Locomotive 35028 "Clan Line" heads train 1Z82 from London Victoria to Southampton as it approaches Hersham station on the Down Slow line. 15th January 2009. 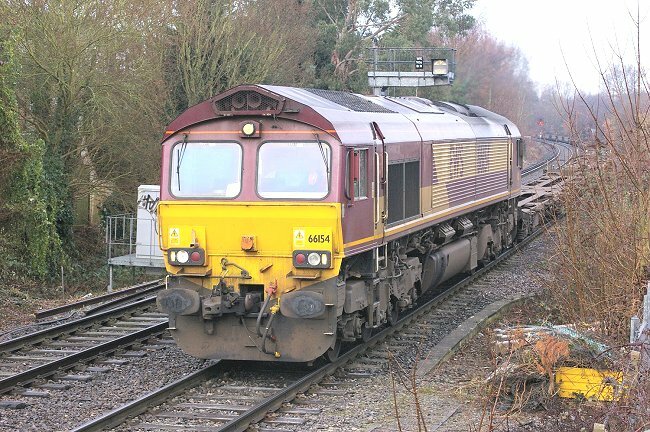 Locomotive 66544 hauls train 6O49 consisting of empty sand hoppers from Neasden to Wool in Dorset. This train runs once a week. The location is Coxes Mill, near Addlestone Junction. 10th January 2009. 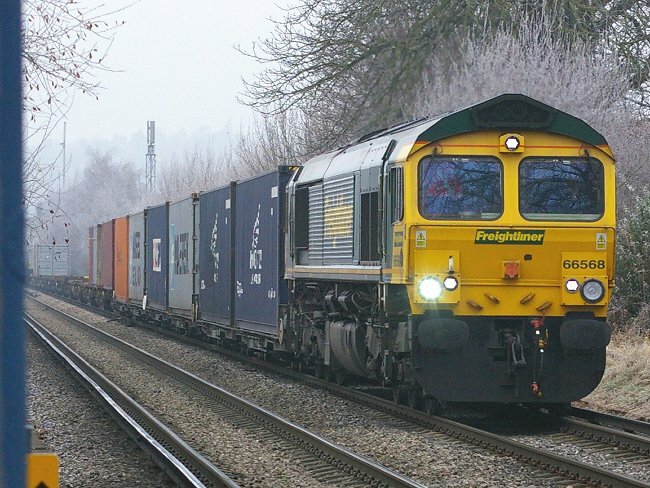 Locomotive 66568 in Freightliner livery appears out of the murk on this frosty day. The train is 4O54 from Leeds to Southampton Millbrook, diverted away from its normal route due to engineering work between Didcot and Oxford. 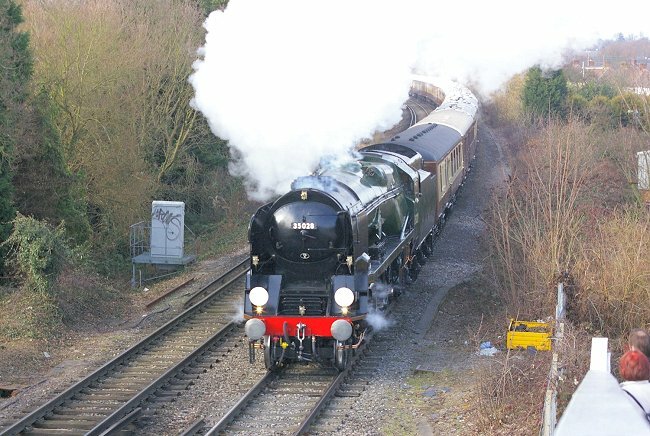 It is seen here passing Addlestone Moor. 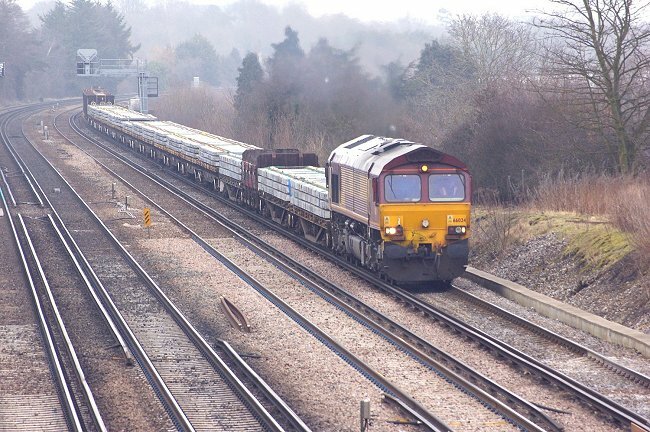 The first few vehicles in the train are very low, so as to accommodate taller containers without the danger of them hitting structures such as bridges and tunnels.